At some point of time, we would come face to face with toddler eating problems. 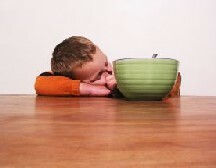 Your toddlers would suddenly become picky eaters or they just could not sit still until they have finished their food. One other common eating problem with children is that they seems to like one particular food one day and the next day, for no apparent reason, they reject the same food that they seems to like just the day before! If your young children have the above eating problems, don't despair. It is part of growing up. First, we need to understand the causes of these toddler eating problems. Then, we can deal with them appropriately using some of the practical ways listed below. As a start, we need to recognise that toddlers have a strong sense of self and they love to explore and are fiercely independent. They often insist on having their way. At this age, they tend to challenge your rules and pull away from you to become their own persons. Feeding is one battle which many parents have fought with their toddlers and lost. Toddlers have little experience in making decisions. They need to learn to decide for themselves. When they do decide, they tend to change their minds often, which is what annoys the parents. This is where much patience is needed. * Encourage your child to try new foods - Vary your toddler’s diet in texture, taste, colour and temperature. Like adults, toddlers appreciate a variety of cuisine. They may enjoy a sandwich or pasta for a change, instead of rice porridge with fish and spinach everyday. * Be creative when serving food that your toddlers dislike - If they do not fancy green leafy vegetables, serve them in delightful ways. For example, turn them into crunchy finger food. * Don't serve heavily spiced foods - Most children don't like very spicy food. Your child may reject a particular food entirely in the future if he has a bad taste experience because he tasted it heavily spiced. * Offer choices that appeal to a toddler’s sense of independence - For example, instead of large meals, you can offer your child mini meals. The choices you offer will help you avoid a battle of wills. Should you choose this method, ensure that the choices you give are well defined. * Keep regular mealtimes - this is to prevent your child from relying on erratic snacks to curb hunger. * Model a balanced diet yourself - Your young child should see you consuming healthy foods and limiting sweets, salty snacks, and soft drinks yourself. * Sit and eat together as a family - focus on each other instead of television shows and other distractions. Do not allow your child to bring toys to the table. Using some of the above tips, I believe a major part of your toddler eating problems would go away. Continue to explore new methods and you will appreciate the time you have with your young children.